Stefany Shaheen doesn’t need to think when asked what was the worst day of her life. It was November 28, 2007, the day her daughter Elle was diagnosed with Type 1 diabetes. Elle and Coach recounts the family’s journey and the trials they faced managing Elle’s chronic illness. Elle was active in the fight against the disease and signed up for many research studies. She and her mom also acted as delegates and spokespeople for the fight to find better treatments and a cure for this autoimmune disease. It was through their advocacy that they learned about medical service dogs who can alert to blood sugar lows and highs simply through their sense of smell. Coach is the dog that changed Elle’s life. 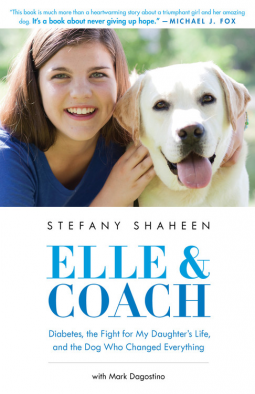 Elle and Coach was written for adults, but is not a difficult read and may appeal to ‘tween and teen readers who are interested in diabetes or medical service dogs. Elle’s story is a strong and courageous young woman and the stories of Coach’s skill are both heartwarming and awe inspiring. I loved this book and read it quickly in a weekend. Coach doesn’t become involved in the story until about half way through, so a warning and a bit of skipping may be called for in the case of dog-loving and impatient younger readers. I think they’ll think the delay is worth it though and cheer on Elle, an amazingly strong and appealing girl. This would be a great addition to middle school and high school libraries or classrooms. Highly recommended. I read Elle and Coach as an electronic ARC courtesy of Hachette Book Group and NetGalley.